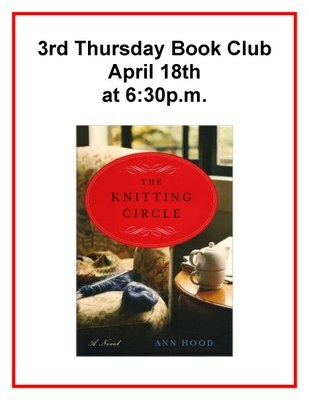 We are the 3rd Thursday Book Club. 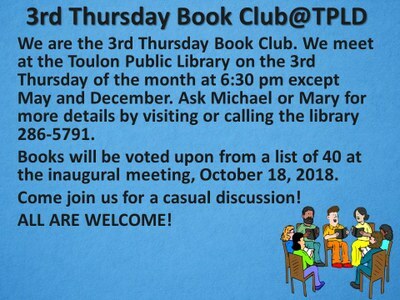 We meet at the Toulon Public Library on the 3rd Thursday of the month at 6:30 pm except May and December. Ask Michael or Mary for more details by visiting or calling the library 286-5791. As World War II draws to a close, Jakob fights with the Polish resistance against the crushing forces of Germany and Russia. They intend to destroy a German troop transport, but Gretl’s unscheduled train reaches the bomb first. Gretl is the only survivor. Though spared from the concentration camp, the orphaned German Jew finds herself lost in a country hostile to her people. When Jakob discovers her, guilt and fatherly compassion prompt him to take her in. For three years, the young man and little girl form a bond over the secrets they must hide from his Catholic family. Raised by well-meaning but overprotective parents and coddled by well-meaning but misbegotten government programs, America's youth are ill-equipped to survive in our highly-competitive global economy. Many of the coming-of-age rituals that have defined the American experience since the Founding: learning the value of working with your hands, leaving home to start a family, becoming economically self-reliant―are being delayed or skipped altogether. The statistics are daunting: 30% of college students drop out after the first year, and only 4 in 10 graduate. One in three 18-to-34 year-olds live with their parents. After the sudden loss of her only child, Stella, Mary Baxter joins a knitting circle in Providence, Rhode Island, as a way to fill the empty hours and lonely days, not knowing that it will change her life. Alice, Scarlet, Lulu, Beth, Harriet, and Ellen welcome Mary into their circle despite her reluctance to open her heart to them. Each woman teaches Mary a new knitting technique, and, as they do, they reveal to her their own personal stories of loss, love, and hope. Eventually, through the hours they spend knitting and talking together, Mary is finally able to tell her own story of grief, and in so doing reclaims her love for her husband, faces the hard truths about her relationship with her mother, and finds the spark of life again. On the night of December 1,1900, Iowa farmer John Hossack was attacked and killed while he slept at home beside his wife, Margaret. On April 11, 1901, after five days of testimony before an all-male jury, Margaret Hossack was found guilty of his murder and sentenced to life in prison. One year later, she was released on bail to await a retrial; jurors at this second trial could not reach a decision, and she was freed. She died August 25, 1916, leaving the mystery of her husband's death unsolved. Things have finally calmed down enough for cozy heroine Joan Spencer and her new husband, Lt. Fred Lundquist, to take a long-delayed honeymoon to celebrate their three-month-old nuptials. Of course, it won’t be a traditional honeymoon, since they’ll have Joan’s teenage son, Andrew, in tow, and the fact that they are using the trip to finally visit Fred’s family makes it even more unusual. But Joan is happy; she’ll get some time away with her family, and she’ll finally get to see the tiny historic Swedish-American community where Fred grew up, Bishop Hill. Growing a perfect moustache, grilling red meat, wooing a woman—who better to deliver this tutelage than the always charming, always manly Nick Offerman, best known as Parks and Recreation’s Ron Swanson? Combining his trademark comic voice and very real expertise in woodworking—he runs his own woodshop—Paddle Your Own Canoe features tales from Offerman’s childhood in small-town Minooka, Illinois. This was one of Evelyn Roark’s students. In over his head with two pigs, a dozen chickens, and a baby due any minute, the acclaimed author of Population: 485 gives us a humorous, heartfelt memoir of a new life in the country. Living in a ramshackle Wisconsin farmhouse—faced with thirty-seven acres of fallen fences and overgrown fields, and informed by his pregnant wife that she intends to deliver their baby at home—Michael Perry plumbs his unorthodox childhood for clues to how to proceed as a farmer, a husband, and a father. You do not have to finish the book, but keep in mind that the ending may be spoiled! Books will be voted upon from a list of 40 at the inaugural, October 2018 meeting. Come join us for a casual discussion! All are welcome. No need to answer. Some may be used to facilitate discussion. How did you experience the book? Were you immediately drawn into the story—or did it take a while? Did the book intrigue, amuse, disturb, alienate, irritate, or frighten you? Who in the book would you like to meet? What would you ask,or say? If you could insert yourself as a character in the book, what role would you play? Consider the ending. Did you expect it or were you surprised? Was it manipulative or forced? Was it neatly wrapped up—maybe too neatly? Or was the story unresolved, ending on an ambiguous note? Can you pick out a passage that strikes you as particularly profound or interesting? Does the book remind you of your own life? An event? A person—like a friend, family member, boss, co-worker? Have you read the author’s other books? Can you discern a similarity—in theme, writing style—between them? Or are they completely different? Do the issues affect your life? How so—directly, on a daily basis, or more generally? Now, or sometime in the future? Does the author—or can you—draw implications for the future? Are there long- or short-term consequences to the issues raised in the book? If so, are they positive or negative? Affirming or frightening? Does the author—or can you—offer solutions to the issues raised in the book? Who would implement those solutions? How probable is success? Did you learn something new? Did it broaden your perspective about a personal or societal issue? Perhaps about another culture in another country or an ethnic/regional culture in your own country?